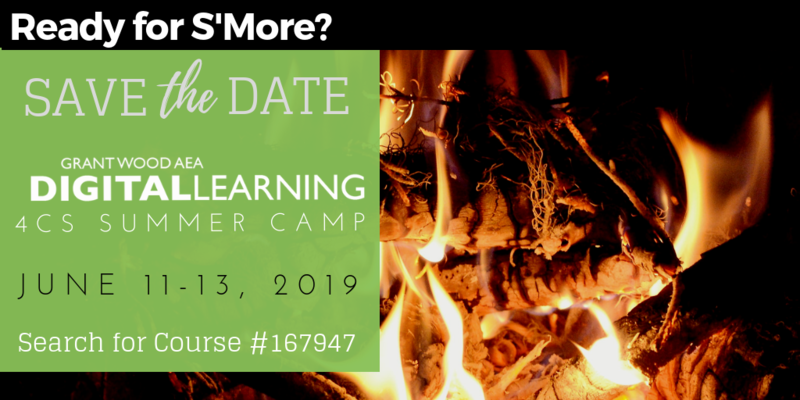 Join us on June 11-13 for our DLGWAEA 4Cs Summer Camp. It's designed for educators who want to redefine their classrooms with a meaningful integration of collaboration, communication, creativity, and critical thinking. Come and learn how digital learning can leverage the 4Cs to evolve your classroom practices. Participants will engage in hands-on learning and application, while also reflecting and setting goals for implementation. Space is limited, so sign up today to reserve your place! The cost for the 4Cs Summer Camp is $125 for 2.5 days of learning & lunch is included. Participants taking this class can opt for one hour of recertification credit (for an additional cost). Use course number #167947 to find and register for this class. The first two days participants will get hands-on with activities that use each of the 4C. Come explore how you can use creativity, communication, collaboration and critical thinking with a variety of tools across the curriculum. Grant Wood AEA is excited to welcome back Craig Badura as our closing keynote. The session will focus on the importance of fostering creativity, communication, collaboration and critical thinking to help give students the skills they need to thrive. Craig Badura is the K-12 technology coach at Aurora Public Schools in Nebraska. He is passionate about making technology ubiquitous in the classroom. He loves his family, coaching golf, teaching and technology! Follow Craig on Twitter @mrbadura and on Instagram @mrbadura. Feel free to contact the Digital Learning Team for more information on this exciting learning opportunity!